Thrift Culture’s shelves are stocked thanks to the generous donations of our community. Your donations are vital to supporting kids in need! 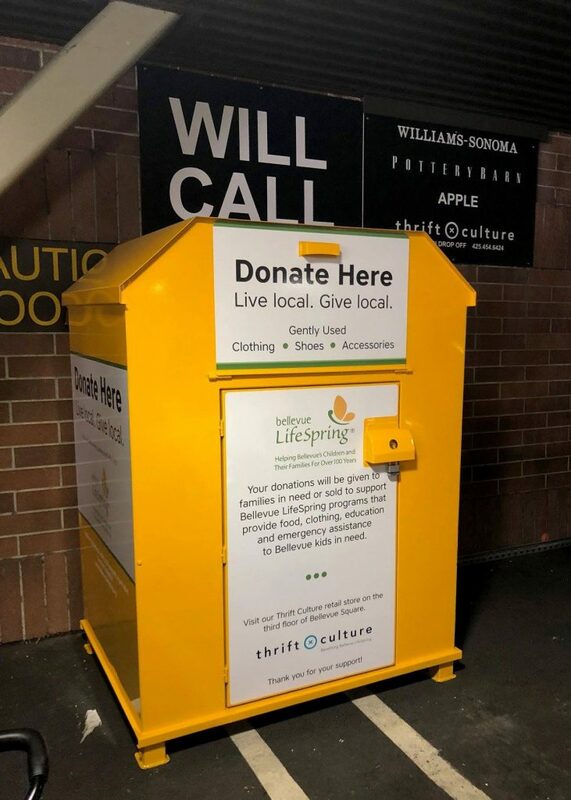 Walk-in donations can be dropped off at Thrift Culture any time during Bellevue Square open hours. You will receive a tax receipt at the time of your donation. We have a convenient donation bin located in the will call area at Bellevue Square. If you have a larger donation and/or need assistance unloading your car, volunteers can meet you there. It may take a few minutes, but we’ll do our best to be speedy! When you arrive, call 425-451-1175 and press 3. Volunteers are available from 9 a.m. to 6 p.m. Monday through Saturday. Coming south on Bellevue Way: Take the first right after Crate and Barrel. Follow the road until you see signs for the Williams Sonoma/Pottery Barn/Apple will call area. 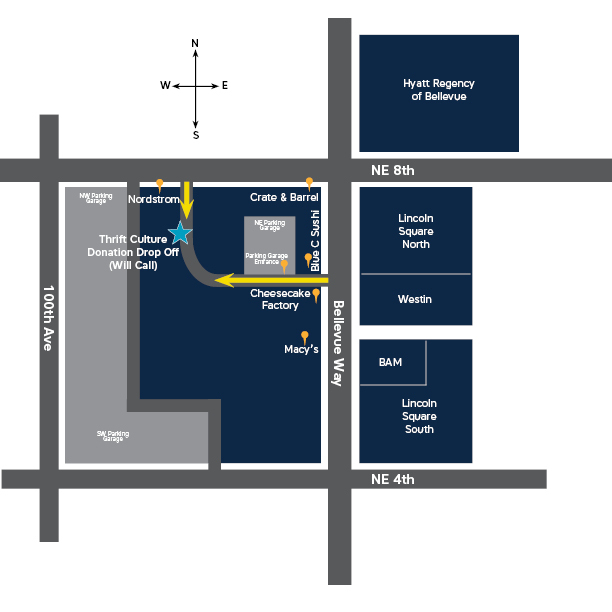 Coming east on NE 8th: Take the first right after Nordstrom. Follow the road until you seen signs for the Williams Sonoma/Pottery Barn/Apple will call area. We are grateful for all donations. However, items that cannot be used require staff time to dispose of them. This raises our expenses and reduces the revenue available for our mission to help Bellevue children living in poverty. Got a question? Give us a call at 425-451-1175 and press 3.